Dressing your home this Christmas season with our fun Goodwill cupcake Christmas tree ornament displays, handmade and hand painted with yummy cupcake with eyes and false eye lashes and red lips, Cupcake lady has a net tutu and long legs with ballerina shoes and ribbons. 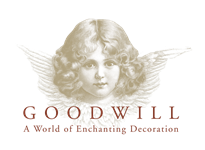 Our Goodwill collection is truly unique and will dress any Christmas tree theme this season. Why not pre order your collection today as sometimes a collection will sell out before there launch date.